I’m a tad reluctant to write this list because let’s face it New Year’s Resolutions are made to be broken. However, I willing to give it a shot because it’s clear my life can be a little overwhelming at times. Learn to say “no” and not feel guilty about it. I don’t have volunteer at every event my hippy parents host or do all of Bobby’s, my best friend and fellow librarian’s, work. Stay as far away from Provost Lepcheck, my boss at Martin College, as possible. Exercise. Chasing Ina Carroll, my landlady, does not count. Convince Ina to remove some of the leprechauns from our shared front lawn. One or two at least. I’m tired of folks slowing down to gawk at the duplex when they drive up the street. Stop worrying about my brother Mark. He’s a grown up and should be able to take care of himself… I think. Don’t let Carmen, my older sister, boss me around… as much. Read more. How many great mysteries did I miss in 2011 because I was preo ccupied by real life killers? Also, I might pick up a few crime-solving tips. Try not to blush every time I see Detective Mains. He’s cute, so what? Get a hold of yourself, girl. 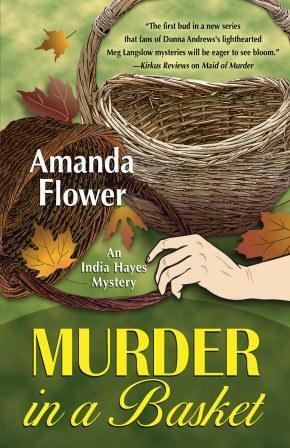 Find out how I do in Murder in a Basket releasing February 8, 2012. Wishing you all a safe and healthy 2012 with good books and laughter! Safe, healthy, good books, and laughter. Great wishes, India, thanks! Resolutions are good, keeping them is difficult! Good luck, India. Great resolutions! Good luck in the New Year, India!